It has been obvious to all except The Renovator for the best part of a week now; today realisation tap danced its way into his consciousness. He is ill. Spending your working day in the company of 25 eight and nine year olds and their hitch-hiking bugs and bogies will do that to you. It takes a while to build up the immunities. However, trooper that he is, he kept a lid on an all-out surrender to the dastardly malaise until after undertaking his turn at Sunday morning tea. What made him select this particular quote above all others, this time around, was the ambiguity people place on this sentiment. 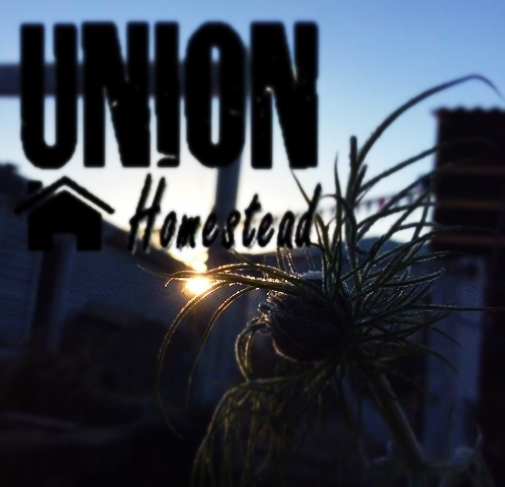 Here on the Homestead, we believe the current tenants of Papatuanuku (Earth Mother) should keep in mind that the next tenants deserve a well maintained, well respected home. The Renovator brought to our attention an online forum where the sentiment was totally reversed: Earth was here before we got here and will outlive us all; She’s tough, she can take a chucked out plastic bottle or a squillion, a dousing with chemicals, a nuclear explosion or two. What the frack?! A lively discussion ensued as we chomped through the heaped plate of potato and bacon croquettes (with dutch mustard and fritessaus on the side), pausing occasionally to listen to his chosen soundtrack. Then today’s host politely excused himself and crawled back to his bed. 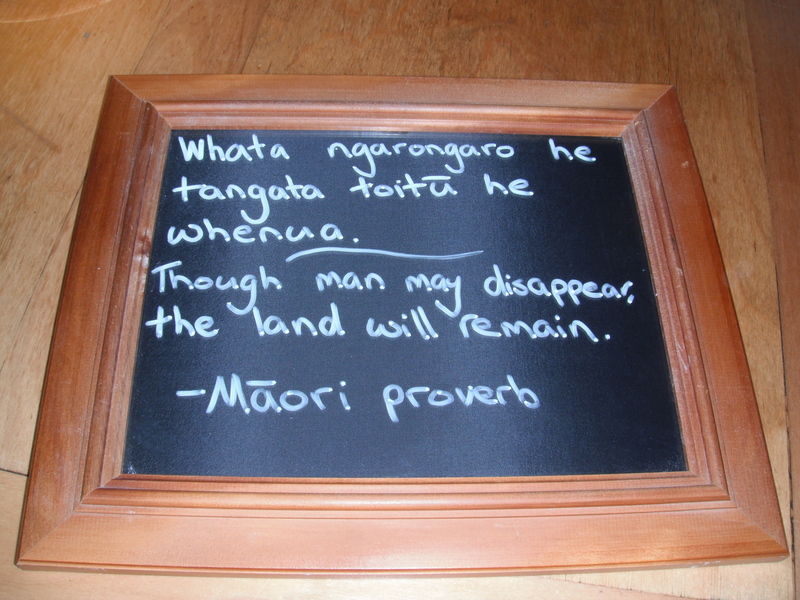 This entry was posted in Sage Words, Union Homestead and tagged environment, maori, motivation, Papatuanuku, quotation, quotations, quote, quotes, sustainability, Te reo maori, word, words. Bookmark the permalink. I agree with the Renovator and hope he sheds his bug quickly. Poor Renavotor, working with children is a joy but it comes indeed with a truckload of different bugs. I wish him lots of pamepring, green tea and a quick recovery! xo Johanna ps and of course, wise words as always! Funnily enough, I was going to suggest hot whiskey toddy as being a fairly good pick me up – and the ad for the first video on his playlist happened to be for scotch…I don’t know what it means… Loved the playlist – well, the first three – I haven’t finished. I got hung up on the scenery in the third one and played it twice. Great quote, and I’m wondering if your family discussion hit on the Julia Roberts thing that is kicking around the web these days. I too had some misgivings about what it implied. When I mentioned it at the dinner table, I inadvertently launched my scientifically minded relatives onto the inevitability of the demise of our planet – something to do with the earth’s core hardening and the moon drifting away slowly but inexorably. Forgive me if I don’t have that quite right – I tuned them out after about 5 minutes because it was that or become mired in the depths of despair. I’m with you – we may only be here a short time, but it is our obligation to look after what we’ve been given, to be able to share it with the future generations, so that they can do the same. There are very few circumstances in which wanton destruction is OK, and ruining the home that was intended for your descendants is not one. I am of the view that we are just passing visitors and don’t matter much in the great scheme of things but that we should behave politely while we are here. Poor Renovator! I hope he gets better soon. I haven’t played his playlist yet as it is midnight, we are staying in a caravan and my husband is asleep! No headphones either! I expect the earth will outlast us but it will last longer and look better if we take care of it while we are here.